Having dispensed with the age-shattering, wallet-busting Heritage Rums of the Tasting of the Century, let’s go to something a little less aged, a little less up-market, a little less well-known, and not at the same level of age or quality — something from, oh, the US. The resurgence of rum and concomitant explosion of small micro-distilleries there suggests that sooner or later we’ll find something from over the pond and south of 49 that’ll wow our socks off. Certainly this rum suggests that it can and implies that it does — when you peruse the website for the Noxx & Dunn 2-4-5, it leaves you with the distinct impression that it’s lovingly handmade by a team of unsung experts working to redefine the category as we know it.There are glitzy photos, weather for various parts of Florida, notes that it is unadded-to and unadulterated, made from Florida molasses, aged in Florida in American oak barrels, and it’s all very positive. “A team of craftsmen with almost a century of knowledge believe that a blend of 2, 4 and 5 years produces the most consistent and drinkable of spirits” they remark, evidently not believing either the names of these craftsmen or consistently good older rums from anywhere else are worth mentioning. Well, never mind my snark, let’s just dive right in and taste the thing. Like many lightly-aged blends it was gold in colour and edged timidly above the standard strength with 43% ABV. The initial nose presented crisply and with a light fruitiness (pears, apples and apricots). It didn’t develop much beyond that, though after half an hour I could sense some vanilla, nuts, brown sugar, flowers and raspberries – and it got sharper, edgier, over time, not less, which is usually the hallmark of a very young rum, or very active barrels (they use once-used ex-bourbon barrels for ageing). Taste-wise, not bad. It felt something like a cross between a light Spanish style anejo and a weak Demerara without distinctly adhering to the profile of either. Dry and crisp, it was not entirely easy on the palate — that’s the uncouth youth coming through — tasting mostly of light white fruits (guavas, pears, that kind of thing), pecans, coffee, oak and leather, and gradually developed those fruity notes the nose had hinted at – raspberries and very ripe cherries, all overlain with tannins, breakfast spices and light molasses. The finish, quite short and sharp, was more sweet-ish, with some bitter chocolate oranges, vanilla, brown sugar and quite a bit of oak bite. My take is that the pot still part doesn’t provide a good balance to the lighter column still portion, the age is still too young, and I felt that the oak was really overactive, exacerbating the driness and slight bitterness beyond the point of being totally approachable – though I say this as an evaluator taking it neat (as I must), not a mixing guru, for whom such a profile would probably shine more. Not a rum to sip really, more one to mix up into a cocktail of some kind. According to Robin Wynne, that sterling barman running Miss Thing’s in Toronto who spotted me the bottle in the first place, “…I [would make] an Old Fashioned with it, or swapping out bourbon in a Vieux Carre with it. Also makes a great rum negroni…” So there are some suggestions for those inclined in that direction. When I started sniffing around, the reps in Toronto were very helpful in providing additional information which is not on the webpage, and the story behind the brand is somewhat more prosaic (and to my mind, rather more interesting) than what’s on public display. 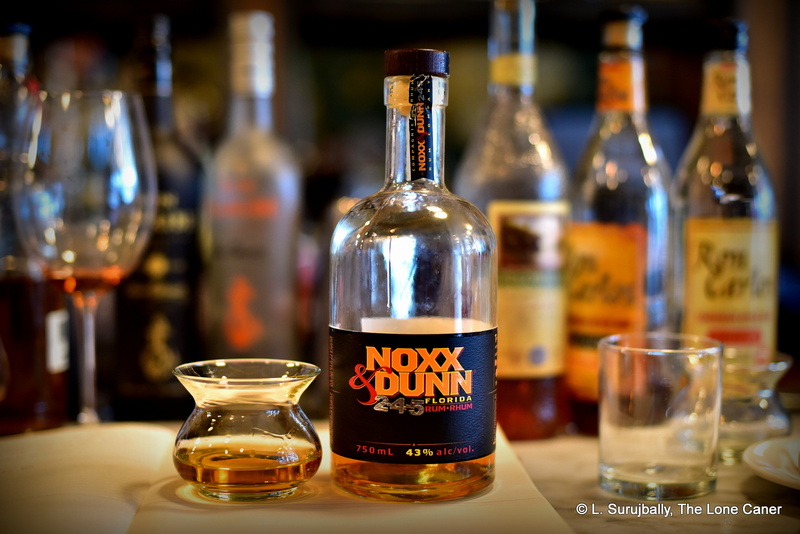 Noxx & Dunn is a relatively new rum on the American scene, created a few years ago by a group of individuals who used to be part of Appleton’s salesforce and were let go when Campari acquired it. They formed their own little outfit called The Tall Tale Spirit company, and this is their only product (so far). It’s meant, as far as I’m able to determine, as a barroom mixer. The rum is primarily (but not totally) column still distillate, the blend of which is a trade secret but kept reasonably constant in order to make for a consistent taste profile. Note that TTS don’t actually own or operate a distillery, or grow sugar cane or anything – the distillation is done by Florida Caribbean Distillers and the source is molasses from the cane grown in that state (see “other notes” below). What we have at the other end of the process, then, is a blended two-year-old rum with added components of rums four and five years old, made under contract to TTS’s specifications. Also on the plus side, there are no additives, it’s 43% and it’s fully aged in Florida in the usual American ex-bourbon oak barrels. Overall, this is the sort of rum that is fine in a bar – which is where I found it – but not for greedily savoured home-consumption or sharing with the rum chums to show off one’s incredible perspicacity in sleuthing out undiscovered steals. Not to diss the makers, who evidently are pouring some real passion into their work, but I think it’s like many other such rums from the USA that aren’t entirely multi-column-still flavoured ethanols: too afraid to go where the flavours might actually lead, too timid to amp it up a few volts and really provide a mixer with balls or a sipper with style. It’s just shy of being a true original and that’s a shame for something that’s otherwise quite intriguing. As noted, the Noxx & Dunn is a contract “private label” operation, not a cane-to-cork producer. The distillery of origin is Florida Caribbean Distillers, located halfway between Orlando and Tampa: they control the Club Caribe Distillery in Puerto Rico, as well as distilleries in Lake Alfred and Auburndale (both in Florida), and provide distillation, storage, ageing and bottling facilities as part of their service. Only one other review of this exists, by the Rum Howler, here. He liked it a lot more than I did, so his opinion is worth noting, given my own more middling score.